Amortization is the debt repayment process wherein a fixed amount is paid off in a certain schedule as agreed upon by both the borrower and lender. It is also called an installment loan. An amortized loan consists of a principal and an interest. 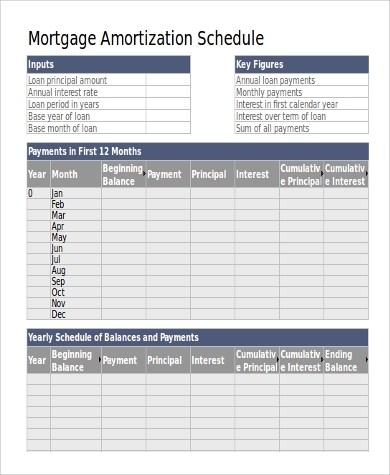 An amortization schedule is a table that contains such details as the principal amount, the interest rate, start date of loan, repayment dates, and the outstanding balance, to name a few. Keeping track of your amortization schedule is important to avoid incurring unwanted fees or penalties. Utilizing an amortization schedule will make this task easy. 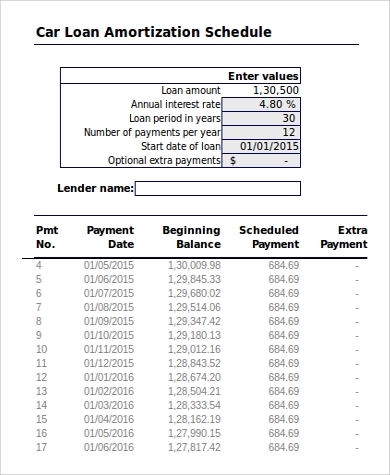 An Amortization Table Excel Samples is also a helpful tool. Calculating the interest from the principal and computing the monthly amount can sometimes be a hassle, especially if you are dealing with a lot of them or if they are in large amounts. 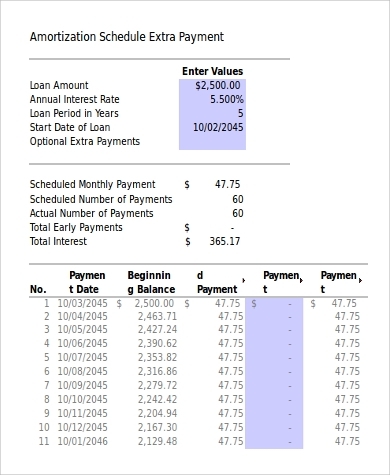 In this case you may need to use Loan Amortization Calculator Templates. For you to better understand how they are calculated and how the schedules are set, we have here some steps do so. You first need to gather all the needed information in order to calculate the loan’s amortization. You need to know the principal, the interest rate, the loan term, and the monthly payment. You need to convert the annual interest rate into a monthly interest rate in order to calculate the amortization. 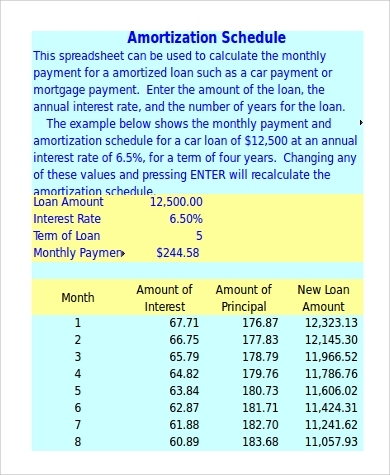 Multiply the principal amount to the monthly interest rate. The product will be the interest rate for one month. Compute the monthly principal amount that you will be paying. Subtract the monthly interest amount from the fixed monthly payment amount. The difference that you will get is the the principal amount and it is what you will be paying every month. Lastly, create a spreadsheet for you to put all the information you have gathered. Also put in the the data that you have computed. That way it will keep track of your schedule and at the same time be organized. Straight line (linear) – Used when an asset is still useful and can still provide benefits. Declining balance – This method is used when during the first years the asset’s value declines. Annuity – Used when the cash flow of the asset is constant over the life of the asset. Bullet (all at once) – An outstanding balance is paid with a one-time lump sum payment. Balloon (amortization payments and large end payment) – It is just like that of the bullet method, but the balloon method is commonly used in mortgage loans and business loans. Increasing balance (negative amortization) – The principal balance of a loan increases if the payments made fail to cover the interest that is due. 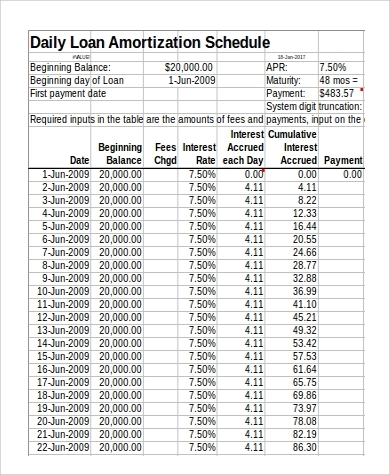 Why Do We Use Amortization Schedules? Amortization schedules must be in chronological order. 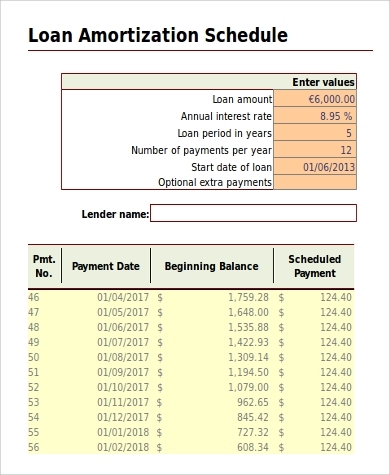 It is a useful tool to keep track of your loan, like your outstanding balance, number of payments left, and the when your last payment will be. Everything you need to know will be in it. 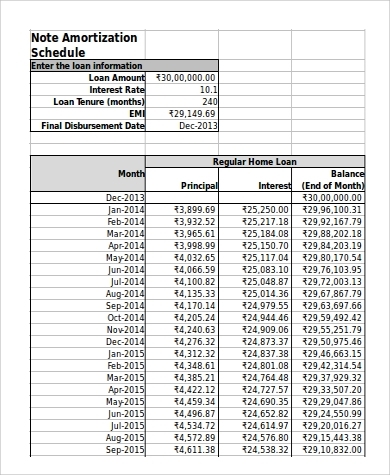 An amortization schedule will also serve as a reminder that your payment schedule is near or if it has been paid. 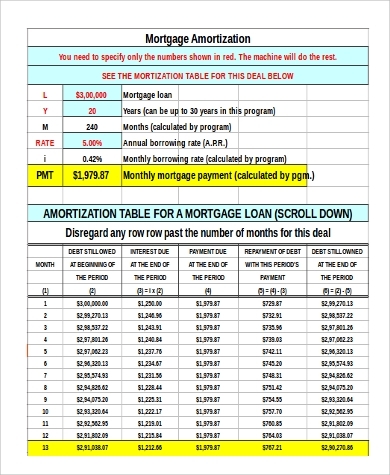 Including the Mortgage Amortization Calculator Templates, they are both indispensable tools if you have a mortgage loan. Don’t go through all the hassle. Download now!